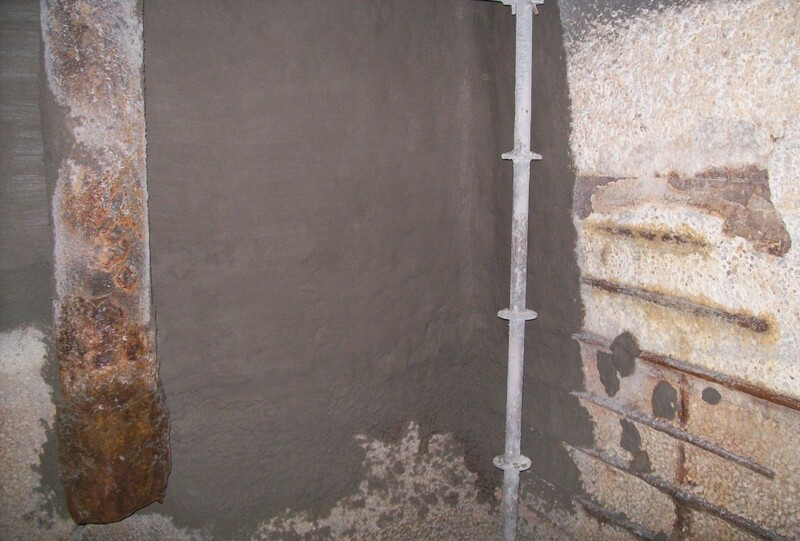 Epoxytec Mortartec Silicate is an industrial-grade, early high strength, high density cementitious mortar, often used for repair and restoration. With the early high strength curing properties, the mortar is also terrific for resurfacing prior to coating. The Mortartec Silicate provides a resurfacing mortar with strength and density suitable for aggressive environments. Epoxytec Mortartec Silicate is a blend of Portland cement, graded silica sand, fibers and silica fume. The mortar may be hand or spray applied, typically from ½” to 2” in depth. Uses include repairing concrete walls, ceilings, lining brick or concrete infrastructure, etc. Mortartec Silicate provides an extremely dense matrix and will accept coatings at earlier ages than typical Portland cement repair products. Typical Uses – Any concrete and masonry surfaces where rehabilitation of an existing structure requires enhancement of the structural integrity. Uses include repairing concrete walls, ceilings, lining brick or concrete infrastructure, etc. Mortartec Silicate provides an extremely dense matrix and will accept coatings at earlier ages than typical Portland cement repair products. Remove all loose concrete, brick or mortar from affected area by mechanical means. Surfaces shall be free of paints, oils, dirt, dust, curing compounds, sealers, form release agents or any material that would prevent mortar from coming into contact with the open pores of the concrete. Shot blasting, sandblasting, chipping and high pressure water blasting (3,500 psi) are all excellent surface preparation methods. Smooth concrete surfaces may require etching with muriatic of sulfamic acid, then thoroughly cleaned with pressure washer. Dampen area to achieve a saturated, surface dry condition(SSD). Leaving no puddles. Must prepare cured Mortartec Silicate with high pressure (3000+ psi) water, with rotating nozzle prior to top coating to remove all surface efflorescence, curing agents, and laitance. NOTE: [The material will flash set if contaminated with calcium aluminate cement.] Ensure proper SSD prior to starting. Make sure all equipment for mixing, pumping, etc. are free from any calcium aluminate cement or products that contain calcium aluminate cement. Begin by adding 1 gallon clean water to mixing vessel and then add 1 bag (60#) Mortartec Silicate. Adjust water as needed (up to 1.4 gallons) to provide proper consistency for placing by hand or pump sprayer. Apply in successive lifts to desired thickness. Use brush, float or trowel to achieve desired texture. Optimal build is between 1/2 – 2 inches, per pass. Shelf life: 12 months, sealed. Storage: Store in a dry area away from direct sunlight. The product should be conditioned to between 40º F and 95º F before use. Epoxytec Mortartec Silicate is an industrial-grade, high density, early strength cementitious mortar often used for repair and restoration. With the early high strength curing properties, the mortar is also terrific for resurfacing prior to coating. The Mortartec Silicate provides a resurfacing mortar with strength and density suitable for aggressive environments. Epoxytec Mortartec Silicate is a popular solution for general rebuilding, restoration, and resurfacing for coating contractors. Reinforced with micro silica and fibers, the product has great high strength properties as a resurfacer to deteriorated substrates for rehab or for areas that may need to tolerate industrial abuse. The Mortartec Silicate is formulated “green.” The system is easy-to-apply by spray or hand trowel for medium build-up at 1/2″ to 2″ in depth, per pass.